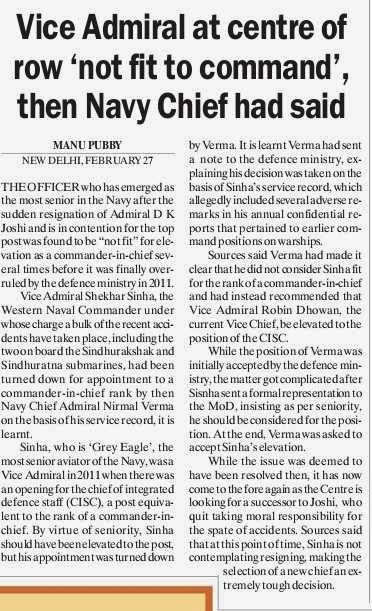 The government has started the process of appointing a new Navy Chief after Admiral DK Joshi resigned yesterday. 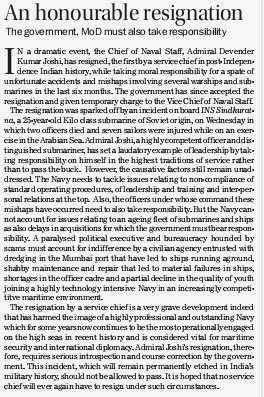 Vice Admiral RK Dhowan, Vice Chief of the Navy, was made Acting Chief after Admiral Joshi resigned owning moral responsibility for the accident on board the submarine INS Sindhuratna yesterday. Admiral Joshi told a group of senior Naval officers today that it was his own decision to resign while Defence Minister AK Antony said he was sad at his resignation, describing him as a “very good man”. Antony said he was sad at the developments. He had met Prime Minister Manmohan Singh and consulted “everybody” before accepting the resignation of an “upset” Admiral Joshi. Admiral Joshi became the first chief of the Navy to resign over accidents involving naval vessels. He was slated to serve till August 2015. 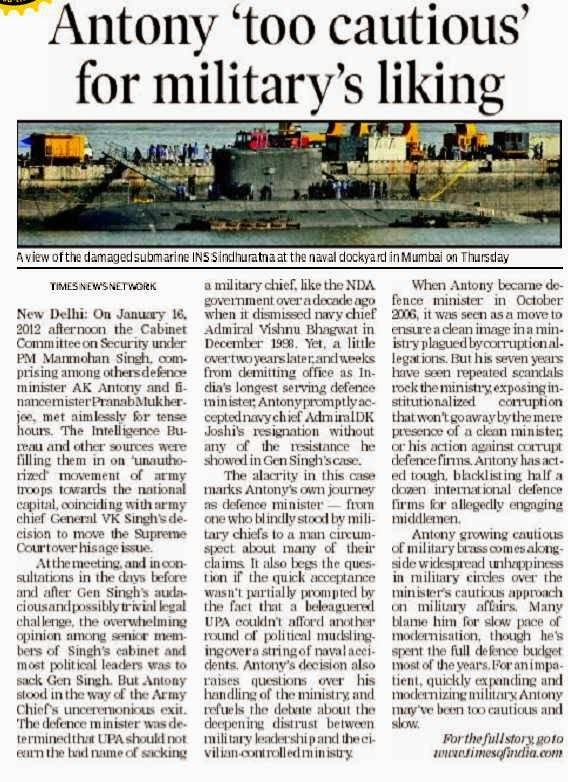 The unprecedented resignation by Naval Chief Admiral DK Joshi has earned him applause from retired soldiers while Defence Minister AK Antony is being questioned for the hasty acceptance of the resignation and not acting like a statesman. The Admiral's decision to resign owning moral responsibility has set the bar high for his peers and successors to follow. 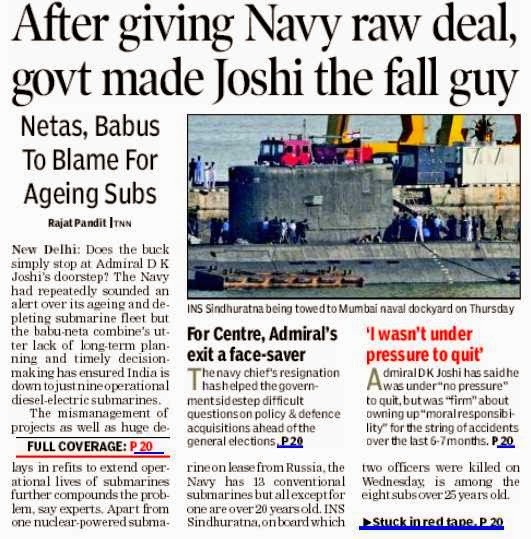 Even though Admiral Joshi is not responsible for the faltering 30-years submarine construction plan, he had paid the price for operating an ageing fleet. The Admiral's resignation has also posed questions as to why the Ministry of Defence is not being revamped to work faster and remove bottle necks as this seems more of a case of delayed modernisation and lack of quality spares. 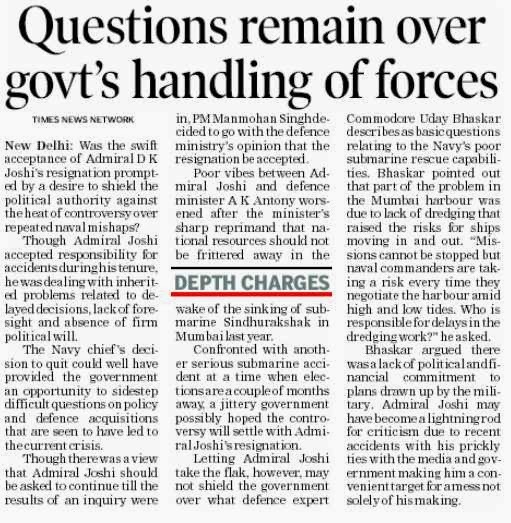 Could the Defence Minister AK Antony have not accepted the resignation immediately and allowed Admiral Joshi to 'cool down'? The haste in accepting the resignation is raising more questions. A serving officer said: "Antony could have let the matter cool down." In the past, Antony showed great level of tolerance towards former Army Chief Gen VK Singh (retd), who embarrassed the government with his age row controversy and litigations. Lt Gen KK Nayyar, a former Vice Chief of the Indian Navy, who has the distinction of having commanded both the Western and Eastern fleets of the Navy, says: "It was a great decision." "It takes years to decide on small matters and the first-ever resignation by a Chief is decided within two hours," Vice Admiral Nayyar said. Within the Navy, officers are shocked. Lt Gen Mohinder Puri, who led the 8 Mountain Division into the Kargil war, and latter went on to become the Deputy Chief of the Indian Army, said "It is an excellent decision". The problem is that Admiral Joshi had to resign for the collective failure of the system. Iranian Foreign Minister Mohammad Javad Zarif today called for increased cooperation between the two countries to stabilise the security situation in the region. Delivering the fifth RK Mishra Memorial lecture on ‘Foreign Policy-Towards Stability in West Asia’, he noted that Afghanistan would soon witness presidential elections, followed by the withdrawal of NATO troops. Zarif, who is on his maiden visit to India after becoming the Foreign Minister, will hold talks with External Affairs Minister Salman Khurshid and other Indian leaders tomorrow. The Iranian leader said India and Iran were in an advanced stage of negotiations for setting up the Chabahar Port that would provide a road link to India to transport its goods to Afghanistan and Central Asia. After a long hiatus, fratricides and suicides have returned to haunt the security forces in conflict-ridden J&K. Senior Army officers dubbed the incidents this year, including today’s carnage in Ganderbal, as stray and isolated and attributed them to a multitude of factors like mobile phone technology, domestic problems back home, denial of leave vis-a-vis the hostile and stressful working conditions of soldiers. After grappling with fratricidal killings and suicides among armed and paramilitary forces in the 90s, reconciliatory measures in the form of liberal leave to soldiers, yoga classes and recreational facilities have paid positive dividends, said a senior officer of the Srinagar-based 15 Corps. “In most cases, their problems back home, which they get to know through their mobile phones, act as a catalyst. They lose their balance of mind and go berserk. But, at the same time, staying connected with one’s family is everyone’s right,” he said. The Ministry of Home Affairs has signed three security agreements — Mutual Legal Assistance Treaty in Criminal Matters; Agreement on Protection of Classified Material; and Agreement on Cooperation in Homeland and Public Security — with Israel today. 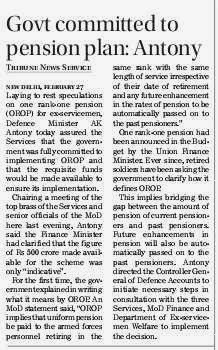 Laying to rest speculations on one rank-one pension (OROP) for ex-servicemen, Defence Minister AK Antony today assured the Services that the government was fully committed to implementing OROP and that the requisite funds would be made available to ensure its implementation. Chairing a meeting of the top brass of the Services and senior officials of the MoD here last evening, Antony said the Finance Minister had clarified that the figure of Rs 500 crore made available for the scheme was only “indicative”. 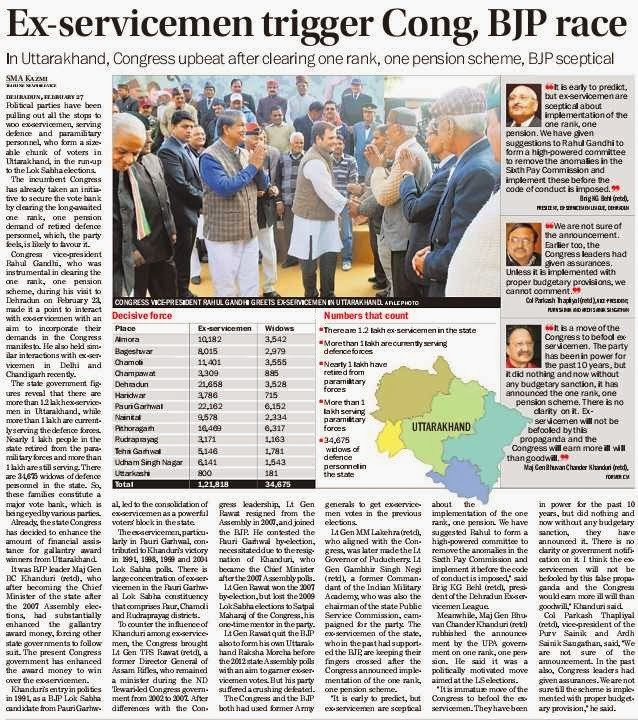 One rank-one pension had been announced in the Budget by the Union Finance Minister. Ever since, retired soldiers have been asking the government to clarify how it defines OROP. This implies bridging the gap between the amount of pension of current pensioners and past pensioners. Future enhancements in pension will also be automatically passed on to the past pensioners. Antony directed the Controller General of Defence Accounts to initiate necessary steps in consultation with the three Services, MoD Finance and Department of Ex-servicemen Welfare to implement the decision. In a dramatic event, the Chief of Naval Staff, Admiral Devender Kumar Joshi, has resigned, the first by a service chief in post-Independence Indian history, while taking moral responsibility for a spate of unfortunate accidents and mishaps involving several warships and submarines in the last six months. The government has since accepted the resignation and given temporary charge to the Vice Chief of Naval Staff. 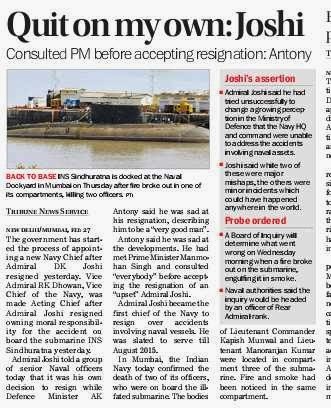 The resignation was sparked off by an incident on board INS Sindhuratna, a 25-year-old Kilo class submarine of Soviet origin, on Wednesday in which two officers died and seven sailors were injured while on an exercise in the Arabian Sea. Admiral Joshi, a highly competent officer and distinguished submariner, has set a laudatory example of leadership by taking responsibility on himself in the highest traditions of service rather than to pass the buck. However, the causative factors still remain unaddressed. The Navy needs to tackle issues relating to non-compliance of standard operating procedures, of leadership and training and inter-personal relations at the top. Also, the officers under whose command these mishaps have occurred need to also take responsibility. 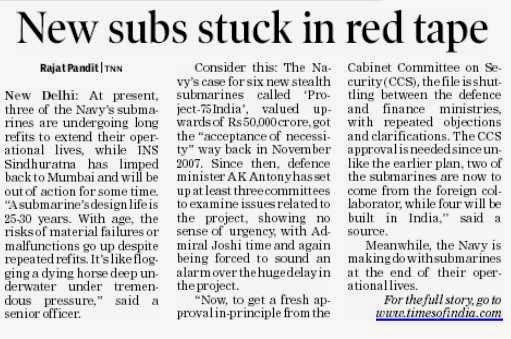 But the Navy cannot account for issues relating to an ageing fleet of submarines and ships as also delays in acquisitions for which the government must bear responsibility. 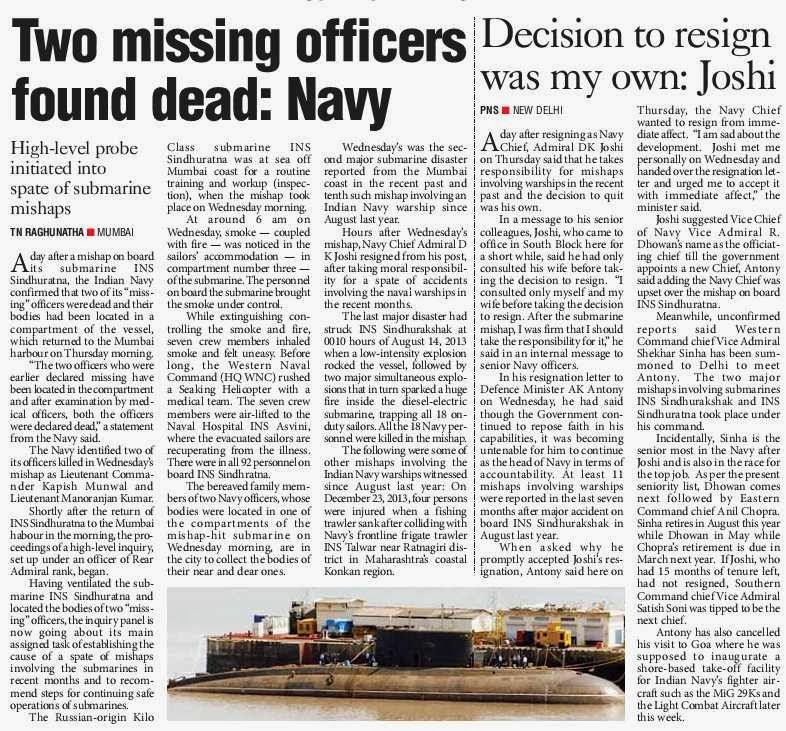 A paralysed political executive and bureaucracy hounded by scams must account for indifference by a civilian agency entrusted with dredging in the Mumbai port that have led to ships running aground, shabby maintenance and repair that led to material failures in ships, shortages in the officer cadre and a partial decline in the quality of youth joining a highly technology intensive Navy in an increasingly competititve maritime environment. The resignation by a service chief is a very grave development indeed that has harmed the image of a highly professional and outstanding Navy which for some years now continues to be the most operationally engaged on the high seas in recent history and is considered vital for maritime security and international diplomacy. 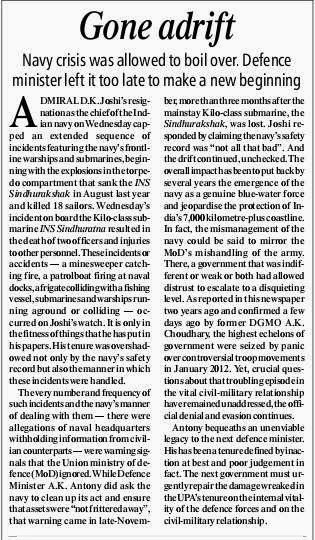 Admiral Joshi's resignation, therefore, requires serious introspection and course correction by the government. This incident, which will remain permanently etched in India’s military history, should not be allowed to pass. It is hoped that no service chief will ever again have to resign under such circumstances. An Army jawan shot dead five of his colleagues while they were sleeping early Thursday morning before committing suicide at the battalion headquarters of 13 Rashtriya Rifles (RR) in central Kashmir's Ganderbal district. The Army has ordered a high level Court of Inquiry into the killings, Srinagar-based defence spokeperson Lt Col NN Joshi said. A police officer told IANS that the angry soldier went berserk inside the Safapora (Manasbal) camp, some 35 km from Srinagar, on the banks of the serene Manasbal Lake, following a heated exchange of words with his colleagues. This is the first major incident of fratricide in Kashmir in the last two years. 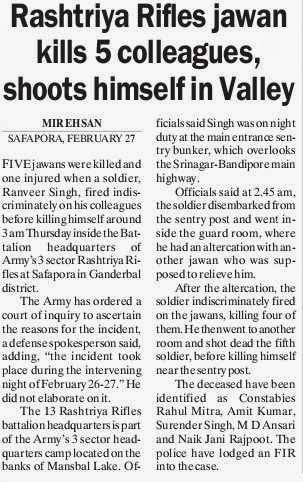 While the Army did not give more details, it is learnt sepoy Ranveer Singh was posted on sentry duty at the main gate of the Army camp. Around 2am, he walked to one of the guard room barracks where some jawans were asleep. 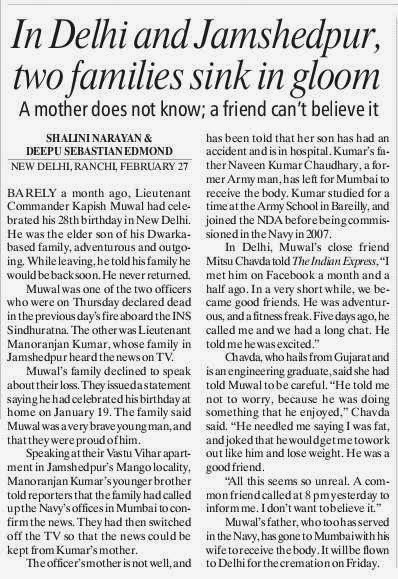 He took a jawan’s rifle and fired indiscriminately. “Five jawans of 13 RR were killed in the indiscriminate firing and another was injured. After the firing, the soldier returned to his post and shot and killed himself with his own service rifle,” a source said. The slain soldiers are: Sepoy Amit Kumar, Lance Naik Tabruq Ansari, Sepoy Surinder Singh, Rifle Man Rajput Joni and Sepoy Mahetre Rahul. Former Army Chief General VK Singh, who was engaged in a bitter battle with the government over his age, is likely join the Bharatiya Janata Party (BJP) on Saturday, according to sources. This comes just two days after General (retired) Singh met Madhya Pradesh Chief Minister Shivraj Singh Chouhan at his official residence in Bhopal. 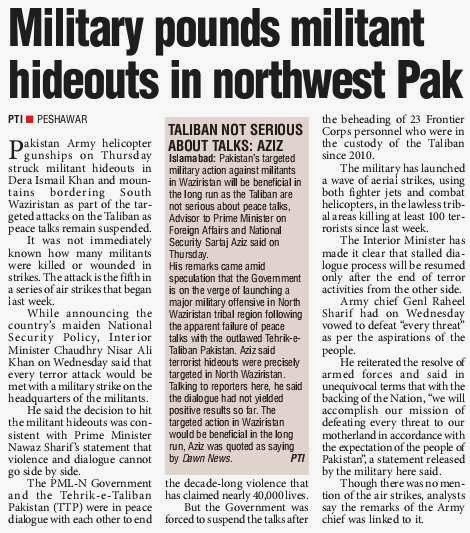 The ex-army chief, though, described that meeting as "courtesy" visit. General (Retd.) Singh had, in October last, ruled out joining the BJP, saying that he was firmly behind veteran activist Anna Hazare in his crusade against corruption. The statement had come close on the heels of his sharing the dais with BJP's prime ministerial candidate Narendra Modi at a rally in Haryana, attended mostly by ex-servicemen. General (Retd.) Singh was the first serving military chief to drag the government to court in the hope of establishing that he was correct in claiming that he was born in 1951, not 1950. Documents with the Army reflected both dates. In his petition in the Supreme Court, he had asked for an explanation of why his claim that he was born in 1951 and not 1950 had been rejected by the Ministry of Defence. The Supreme Court, however, had upheld the government's decision on the issue, saying it was not in favour of entertaining the Army Chief's petition. 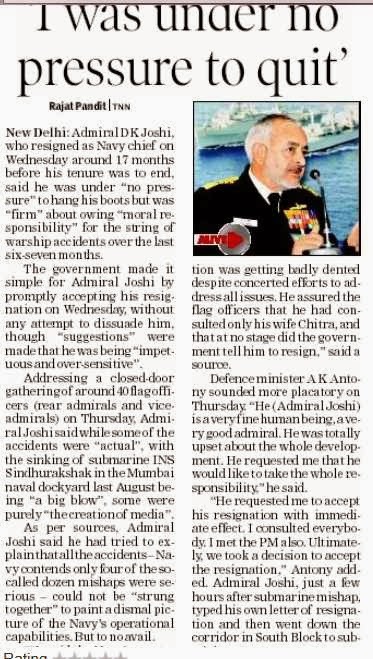 Admiral DK Joshi, who stunned the country yesterday by resigning as Navy Chief taking moral responsibility over a series of accidents, has said that he had only consulted his wife on the decision. "It was my decision alone. I only consulted my wife. 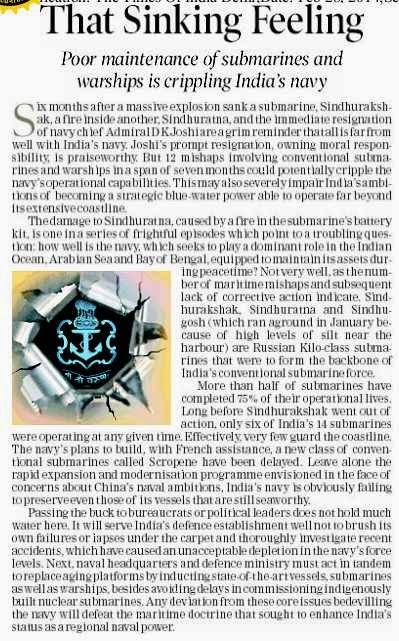 I was firm that I must take responsibility for the incidents," Admiral Joshi told a gathering of the Navy's seniormost officers in Delhi. His wife, he said, told him that he must go ahead if he was convinced. 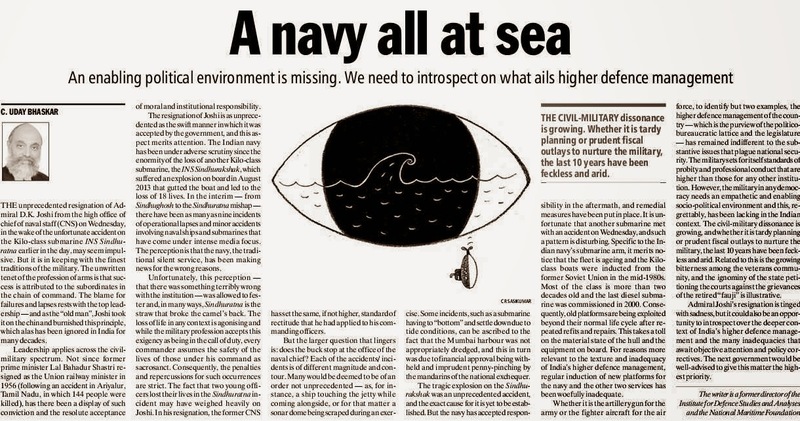 Admiral Joshi, who took over as Chief of Naval Staff in 2012, said he had tried unsuccessfully to change a growing perception that the Navy Headquarters and Command were unable to address the problem of accidents involving naval assets. The Indian Navy has seen 10 accidents in the last seven months. Admiral Joshi discussed with the two-star and three-star officers he met, that while two of these had been major mishaps, the others were more minor incidents which could have happened anywhere in the world. 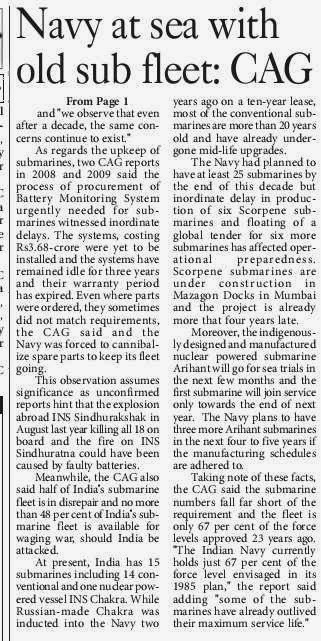 The 59-year-old resigned yesterday, hours after a fire was reported on the Navy submarine INS Sindhuratna, which was being sea-tested about 50 kilometres off the Mumbai shore. Two officers were killed and seven sailors were taken seriously ill. In his resignation letter, Admiral Joshi had said though the government continued to repose faith in his capabilities, it was becoming untenable for him to continue as the head of the maritime force in terms of accountability. His resignation was promptly accepted by Defence Minister AK Antony, and Vice Chief of Naval Staff Vice Admiral RK Dhowan was asked to take over as acting Chief till the next chief is appointed. Admiral Joshi, who belongs to Uttarakhand, had 15 more months to go of his tenure as chief. He served in a variety of command, staff and instructional appointments during his 41-year career, including captaining the guided missile corvette INS Kuthar, the guided missile destroyer INS Ranvir and the aircraft carrier INS Viraat. 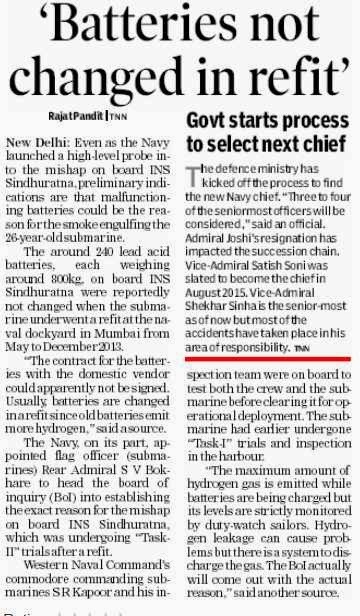 The navy said Lieutenant Commander Kapish Muwal and Lieutenant Manoranjan Kumar died in the INS Sindhuratna fire. They had been declared missing yesterday after the accident in which seven sailors were injured. Their bodies were found in a submarine compartment. Reports suggest the fire that broke out in the 25-year-old submarine could be due to malfunctioning batteries. 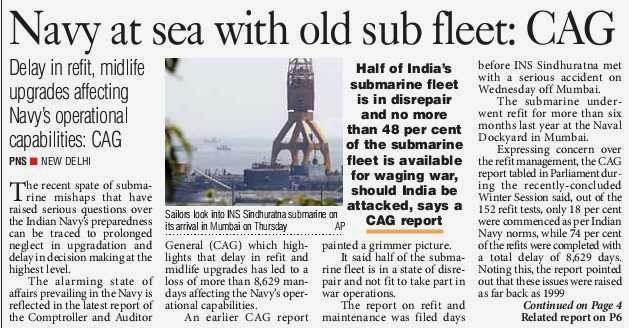 The submarine was being sea tested after a refit; its batteries were reportedly not replaced because contracts were not finalised in time. 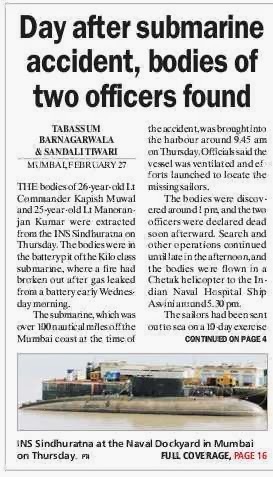 Seven sailors fell unconscious from suffocation while trying to control the fire and smoke and had to be airlifted to a Navy hospital in Mumbai. The submarine surfaced after the smoke was detected. The Russian-origin Kilo Class submarine, one of India's 14 conventional submarines, was carrying no weapons or ammunition. It had sailed out on Tuesday night and since it was still being tested, had not been placed under operational command yet. Admiral DK Joshi resigned as Navy Chief hours after the accident. "It was my decision. I only consulted my wife," he told a gathering of naval officers in Delhi today. Defence Minister AK Antony, who has been criticised for accepting his resignation said, "I am very sad about the incident. Joshi came to me. He was very disturbed about the whole development. He said he would like to take responsibility and insisted that I accept his resignation. So I consulted everybody and the Prime Minister and ultimately took a decision to accept it." Former defence officers and experts say the minister should also resign. "Admiral Joshi has held himself to the highest standards of public morality. Mr Antony had the option to tell him not to go," said strategic expert Admiral Raja Menon. Earlier this month, an amphibious warfare vessel INS Airavat ran aground after which its commanding officer was stripped of his command duties.